Four full size and a whole lot of 1 gram samples I split with others. 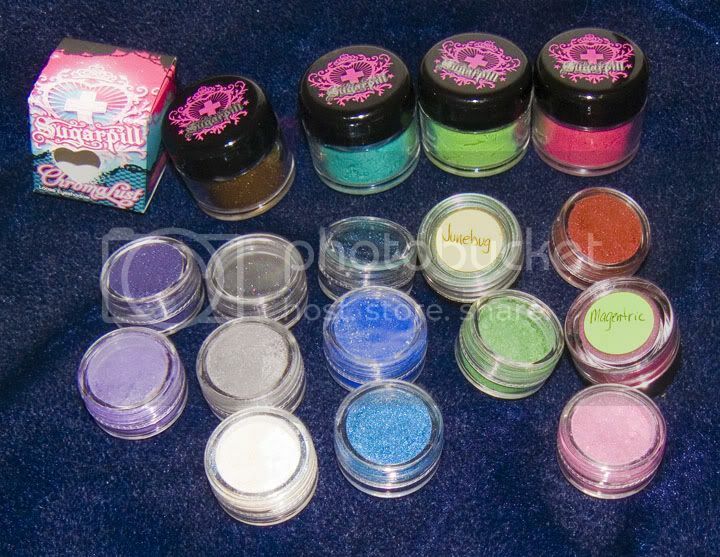 Sugarpill larger than life pigments are things you might want to share. I'm only missing one shade Hysteric in my stash. 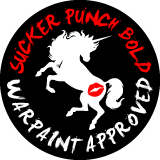 Flash swatch no primer: Stella, Tiara, Goldilux, Lumi, Weekender, Paperdoll, Magpie, Royal Sugar, Starling, Darling, Junebug, Tipsy, Absinthe, Asylum, Magentric, Decora, and Birthday Girl. Product: These are pretty potent pigment that doesn't have a wet base meaning there shelf life will be longer then a MAC or Inglot pigment. Because of this they need to pat the colour onto a base or using a mixing medium to make apply these without fall out issues. MAC and Inglot pigments have a wet base that help the to clump up more and stick to your brush better. This isn't a con for me however. The only dud for me was Tiara in the that it's more shimmer/glitter then shine/metallic compared to Goldilux. Colour: Excellent vibrant colours like the pan shadows. The finish is also mostly shimmer/metallic with Stella being the excepting as it's more of a matte black base with rainbow shimmer. Wear: With a base and/or mixing medium these do stay all day without any fading. On there own and just water they do fade evenly to a sheer wash as they are pure pigment base just fall off. Packaging: Large jars to hold that whooping 4 grams of products that is double the amount most pigment companies charge at a $12 price point and Half the price of MAC pigments. Compare: FaceFront Cosmetic, NAKED Cosmetics and many indie brands do pigment with simple bases and inorganic ingredients that have a long shelf life for that reason. Despite a learning curve in working with pigments it's worth it to have a go at them for some interesting shade effects and finishes. Although these are loose shadows and in no way able to last on their own for sixteen hours, but with a simple base/medium they will perform for the whole day without issue or creasing I've found. The shades range and finish on these are divine and diva (true metallic gold, yes please). Sugarpill is all about the pop of colour as there are so many lines that go for the subdued range, this is how they stand out from the crowd. This post is the best, I can't believe it has no comments! I was having headaches trying to compare swatches, so I adore this. I think I'm set on Goldilux and Darling, though I'm tempted to get a third to round them off (which?). Because I'm a new blogger I don't have enough hits to bump up in search engines yet. Lumi id great in person you can see a teal reflex. Royal Sugar is another favourite, It's such a rich blue. Ah, fair enough! Would you say Lumi is any good for highlighting the inner corner of the eye? Tes it is but it make for a cool tone brightener. I've been using Inglot for some of the more unusual colors that are sometimes needed for cosplay. 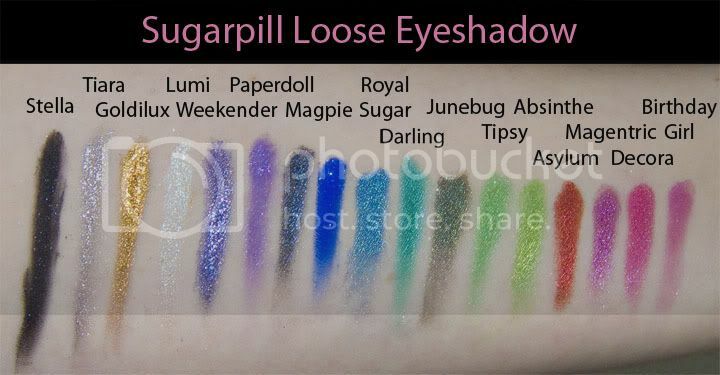 I love Sugarpill's color palette, but loose powders....? Eh, looks scary to me! How do you actually put them on? Do you put a primer on your eyelid, then dip your brush in the pigment? Or do you remove some of the product, mix with something (foundation? primer?) and then apply the pigment? Also, is this safe for use as an eyeliner?